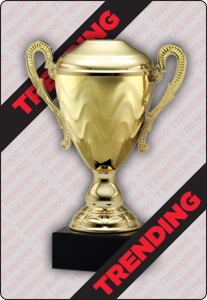 Looking for a bold, eye-catching soccer trophy? Look no further than our 3D Popout Oval Resin Series. This soccer trophy features a female soccer player on the pitch, mid-run and ready to kick the ball. The soccer net and soccer field are detailed in the background, and the trophy is highlighted with a gold colored border and shooting stars at the base.